That's right. On Saturday, I turn thirty years old. And I'm not dreading it. It actually feels like a somewhat exciting milestone to hit. I am exactly where I wanted to be when I thought about being 30 many many years ago. I have a beautiful family and am full of happiness; I cannot ask for much more. I've accomplished all that I have wanted to in my first thirty years, and I look forward to all the adventures that still await. I have a feeling my thirties will treat me well! Becoming a "thirty-something" does make me feel a bit old, but hey, I don't even have any grays hairs yet! I do however have some perpetually tired moms eyes (parenthood gives you wrinkles), and my hands are starting to look more & more like that of an old woman's (why do the hands age first?!). But I feel great! So I'm choosing to be excited about this birthday and hopefully all the birthdays that follow. While many of my friends have taken wild trips to Vegas, or Mexico, or Hawaii to celebrate their 30th, I will be home at 8 pm putting my kids to sleep. There will be no bottle service, no hangovers. No risk taking, no bad decisions. But that is okay. I used to dream of the day when I would have my own kids and sweet husband to kiss goodnight. I will be exactly where I have always wanted to be on my 30th. My best friend from Delaware is flying in for my birthday weekend (which was a surprise to me just a few days ago), and I haven't seen her in 3 years!!! This will make my weekend even more special. And I will get a chance to sneak away for a least a couple of celebratory cocktails, it will just have to happen at the early hour of 6pm. Happy hour is the new last call! So cheers & have a drink for me! I turn 30 next June, and it definitely feels like a big milestone looming ahead. However, I have never thought of it in the way that you just said - about accomplishing the things you'd dreamed of. I too, have accomplished all that I wanted to accomplish by 30, but have never sat and thought about how rare that is. And that's pretty amazing! So, 30 will be a good way to celebrate the accomplishments of our 20's (I mean, loving families and healthy babies - could there be anything better?) And to then move forward into a new decade with excitement about all that is to come! Happy early birthday, Laura! Your birthday is my anniversary! So we will both be celebrating and in bed by 9pm :) Happy early birthday! Happy Birthday! 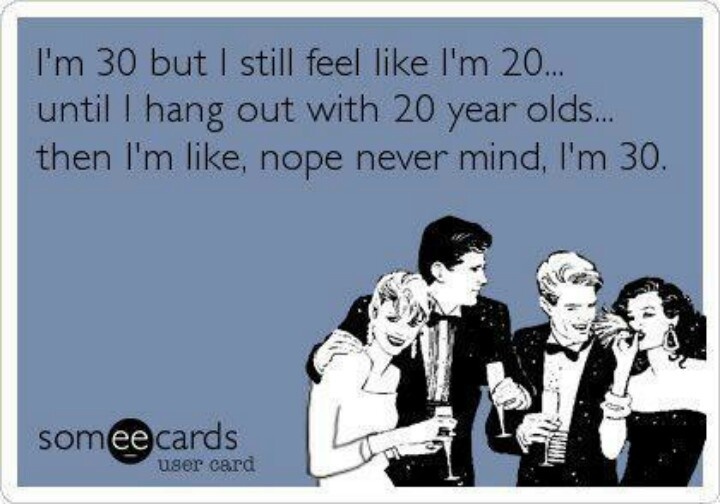 I felt the same way when I turned 30... A little old but exactly where I wanted to be in my life! At the time most of my friends didn't have kids so they all had big parties. We decided to go on a family vacation instead... It was perfect :). Hope you have a fantastic weekend celebrating with your guys and your friend! Have so much fun!! I spent my 30th the same way....take out ziti and meatballs with a 5 month old. I wouldn't have had it any other way!! I totally agree- I was totally at peace with turning 30 (i'm 34 now.) My friends who struggled more with it were not where they envisioned they would be (not married, not settled in a job etc.) Enjoy your weeekend with your friend and boys and happy early birthday! Happy birthday!! I hope your boys spoil you! Have fun celebrating! Happy early birthday!!! You are so young!! :) Hope you have a blast with your bestie this weekend! November babies unite! Where as I dont feel old I do have some gray hairs and they bum me out no end. You best bet I pull them out when I find them ;) Have a wonderful Birthday celebration! My mom always says don't forget sunscreen (or SPF moisturizer) on the tops of your hands, help protect them a little more!! Not where we usually think/remember to apply. Hope you have an amazing birthday weekend!! I turn 30 in June and am definitely looking forward to the celebration! I'm like you, happy to see what the future continues to hold for me! Fellow Scorpio!! My birthday is on the 9th :) I love the perspective you have with turning 30. I can't say I turned 30 with such grace. ha! I for sure have a few gray hairs, but thankfully can still be hidden with a sweeping of the hair. I must say, my tired mom eyes, definitely don't bother me and am something I'm quite proud of! Happy Birthday weekend! Enjoy your round of happy hour cocktails!!! Happy belated birthday! I hope it was a good one, and that you have a fantastic year!